For over 19 years, Buena Homes Construction Co. has been a full service general contracting company in Southern California specializing in Residential Blueprints and General Construction for contractors and home owners based in OxnardContractor.com. Want to build your own home or remodeling? Are you a contractor that need plans for your client? 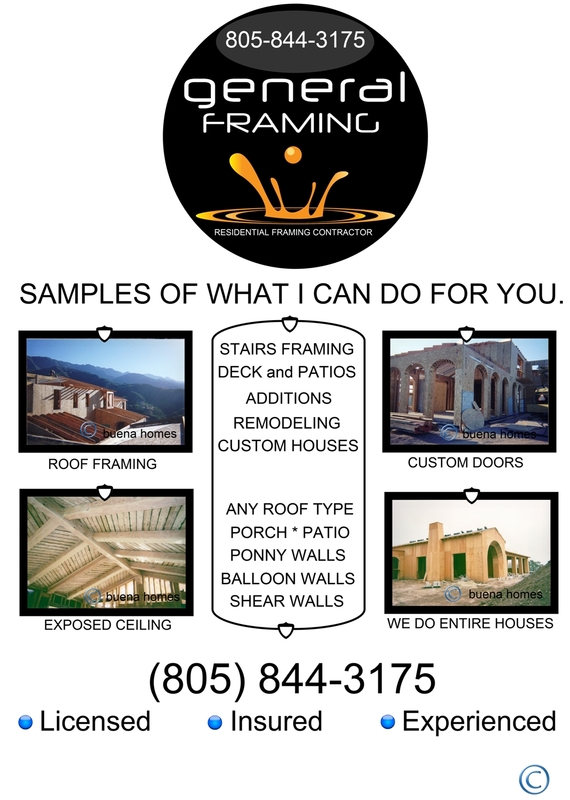 OR do you need a General Contractor to fully and thoroughly build for you? You’ve landed on the right site! Buena Homes Plans is the best place to find the perfect floor plan for you and your family. Our selection of customizable house layouts is as diverse as it is huge, and most blueprints come with free modification estimates. We also offer a low price guarantee in addition to free Printing up to 3 set and competitively priced cost to build reports. Whether you’re looking to build a narrow Craftsman Bungalow house plan in the southern California Mountains, a sprawling contemporary Ranch floor plan in the valley, a luxurious modern Farmhouse design in the country side in Ojai, or something else entirely in Ventura County, Los Angeles County, Santa Barbara County, start your home building journey with us today and shop with confidence. Buena Homes Construction has worked with several large commercial companies and contractors such as Pier 1 Imports, Pacific Construction, Verizon, California Pizza Kitchens, Sylvan Learning Centers, Hugo Boss, I-Care Urgent Care Centers, City of Ventura, Sycamore Apartments, Ventura Community Hospital...just to name a few. We hold ourselves to very high standards, and we do our absolute best to live up to them. Customers and subcontractors alike return to work with us again and again because of our honesty and fairness without compromising quality and efficiency. Our focus on every project begins with service to our customers. We believe that we cannot obtain success without making sure our customers are 100% satisfied. We strive to complete every project on budget, of the utmost quality and ahead of schedules. Customer satisfaction is of upmost importance to each and everyone working for Buena Homes Construction. Buena Homes Builder - Oxnard Contractor. We have estimated based on previous jobs that we will charge to any type of residential design a fix-rate cost of $4.25 * per square foot, this includes the cost of consultations, designing, ink, traveling costs, papers for blue printing, and free 3D view before construction or authorization to go ahead for submittal. We normally will ask you to make a 10% or $1000 down payment which ever it’s less. The blue print also will include the elevations, floor plans, sections, electrical plan, plumbing plans (no isometrics), window schedule, door schedule, plot plans, roof details, footing details, section details, ceiling plans, electrical plans, stucco color specifications, drywall material texture specifications, and any other related detail. What’s not included is the cost of the STRUCTURAL calculations, this have to be done by an Engineer (this cost might be avoid, if only if the correspondent jurisdiction approves it and that the design become conventional). Another cost not included in the price mentioned above, it’s that the city permit fees and taxes or/and school fees. Consider this; We are a General Contractor+Construction Firm, that can and will provide you an excellent, clean professional service for designing your home plan. Besides, if we are granted the General Construction of your project (no matter what size may be) we will give you an extra 30% discount in the design cost. -Buena Homes Builder. * Call Us for more details in pricing. Start Your Blueprints Today HERE!